Pro²Future was first-time represented at the Hannover Industry Exhibition, which took place from 23rd – 27th April. CEO Heimo Theuretzbacher-Fritz and Area Manager Georg Weichhart presented our competence centre as part of the joint stand of the UAR Innovation Network of our shareholder Upper Austrian Research GmbH. 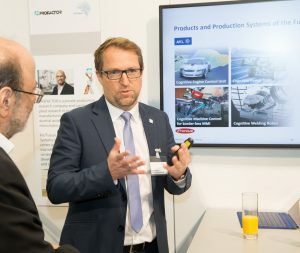 The world’s largest industrial trade fair with more than 5,000 exhibitors and more than 200,000 visitors was further an ideal opportunity for introducing the two new COMET-centres Pro²Future and CDP to interested experts in a co-event on the 26th of April. 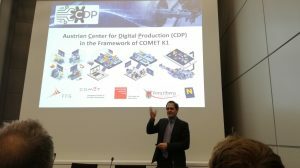 With emphasis on the title „Research for Industry 4.0 ‑ and beyond…”, Theuretzbacher-Fritz and Weichhart jointly elaborated together with Christoph Pollak, CEO of CDP centre , on how the challenges of industrial digitalization are addressed by the two centers, in particular through their joint research program. 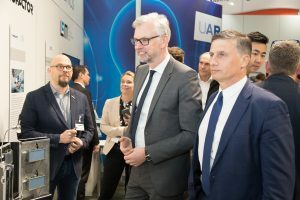 Another highlight was Michael Strugl, deputy governor of Upper Austria, attending the exhibition on April 24th being able to gain a picture of Pro²Future’s research work at the UAR joint stand. 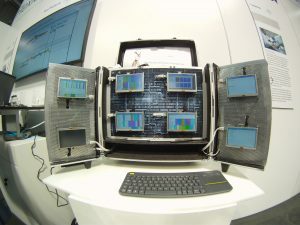 Weichhart presented the adaptive scheduling-demonstrator, which was developed together with our scientific partner PROFACTOR: Eight Raspberry Pis use a newly developed multi-agent algorithm to optimize the collaboration planning of a multiple machines production process. 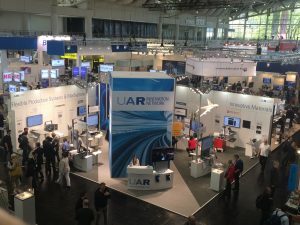 Last but not least, it should be emphasized that the participation in the UAR joint stand enabled an excellent exchange with other non-university research centers within the UAR Innovation Network, e.g. the Software Competence-Center Hagenberg (SCCH) or the Linz Center of Mechatronics (LCM).